So just what is an allosteric kinase inhibitor? 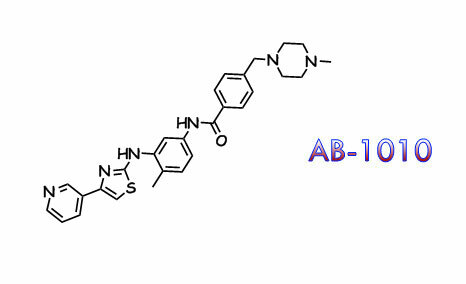 aka: Masivet, Kinavet & AB-1010 quietly joined the Phase iii club when it went Ph3 back in December. It’d be great if someone were to crystallize the first hit with Abl or Kit and compare this with 1IEP. I suspect this would put the paradigm of structure based design in perspective. Adding a methyl group alpha to the the pyridine will make the activity of most kinases go away given a steric clash with the neighboring carbonyl. It’s interesting that the c-Kit activity stays behind, but the evidence given for the dehydron effect is through molecular dynamics and while as a rule I’ll try not to hold that against them, I don’t believe that the authors give a satisfactory answer as to why this new methyl group does not negate the compounds c-Kit activity through a simple steric interaction. Read all about it in the ’06 BMCL, the ’07 BMCL, the 2E2B, or through an Open Access offering here. �Their latest application is a gleevec analog with a pyrrolopyrimidine hinge interaction, which looks nice enough. I wager they’re looking at a potency / selectivity angle. The added imidazo group probably brings in something like TIE2, or IKK… Think they could be a little more vague in your claims though? >> Update. Ok, ok I guess there is more too it. I didn’t notice on the first pass but they claim to hit some Gleevec resistant strains. Good show.